A pressure reducer decreases the fluid downstream pressure to a given and stable value in spite of a variable upstream pressure and its flow rate. An overpressure valve or surplus valve maintains a stable and given upstream pressure with an adjustable flow rate. The indirect operated device of the ETNA Industrie pressure reducer allows complete tightness on closing and ensures precise and high downstream pressure stability. A non-return system precludes any possibility of the downstream piping draining into upstream piping. A balancing piston enables compensation for a variation of upstream pressure, maintaining a tough and stable downstream pressure. 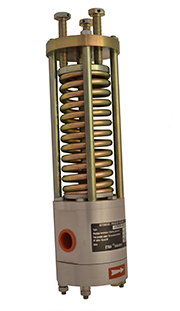 The ETNA Industrie pressure reducer ensures intensive usage without any hunting and vibration. The design of over pressure valves is very closely related to that of safety valves. Insensibility to downstream pressure as well as high opening pressure stability and a complete tightness on closing enable’s ETNA safety valves to be used as surplus valves, provided a setting wheel is implemented on the valve.